What do you do with leftover pumpkin puree? For me, it's easy. I turn it into pancakes. And I think you should too. And then I think you should stack them high, drizzle drown them with maple syrup and top with a generous pat of cinnamon brown butter spread. Can I just repeat that last bit? Cinnamon. Brown. Butter. This butter is all kinds of incredible. It's ten times better than your regular cinnamon butter, but then you wouldn't expect anything else. It's butter made with brown butter and lightly sweetened with some honey. Butter butter butter. I am actually in love with this shot. See those brown butter and cinnamon flecks? Are you running to your kitchen? Wait up, though, don't forget the pancakes! These pancakes come from Nigella, who I think should make podcasts so that I can listen to her voice all day long. These are American pancakes, soft and fluffy, like little pumpkin pillows. They'll bring back memories of fall - or, if it is fall season where you are now, they'll be the perfect thing for breakfast tomorrow. This combination of pancakes and butter in particular was inspired by Gilmore Girls, which was one of my favorite shows growing up. Heck, I still love it. And somewhere in the fourth season, I've forgotten which episode, the girls go to Luke's who makes them pumpkin pancakes with homemade cinnamon butter. And with a name so delectable, it would stick with you. It did with me. But I think I might have just gone one step better. Note: these pancakes aren't very sweet at all, which is fine if you're the type of person who likes to drown your pancakes in syrup, like me. If you usually take your pancakes plain, then you might like to increase the amount of sugar. Also, this recipe makes a whole lot of pancakes. I got about 12 medium sized pancakes out of this. If you have leftovers, put them in the freezer and toast them hot the next morning for breakfast. Whisk pumpkin, eggs and buttermilk together in a medium bowl. Add flour, spice, sugar, baking powder, baking soda and salt, and mix until smooth. Heat a skillet (or if you have one, a flat griddle would make this job much faster) over medium heat and drizzle in about a teaspoon of vegetable oil. Cook pancakes in batches. When bubbles start to form on the surface, flip them over and cook for about a minute on the other side. If you've got a small skillet and can only cook a small amount at a time, you can keep the pancakes warm in a low oven or under some aluminum foil. Note: the reason I only used 75g of butter, which seems neither here nor there, is because that was exactly the amount I had left in the fridge. But you can easily double this or use a full stick - I'd brown about a third of whatever amount of butter you want to use. Heat 25g of the butter in a small saucepan until it melts, bubbles and turns brown. Take off the heat and let cool. In a blender, whiz together the softened butter, browned butter and cinnamon. Slowly drizzle in the honey and blend. Scrape the sides of the bowl to get everything mixed evenly. Put the butter in the fridge to firm up. This is wonderful on toast, english muffins, or these lovely pumpkin pancakes. Thanks, just what I was surfing for. Wanted to use up some pumpkin and the kids want pancakes for Sunday brunch. I hope you and your kids enjoyed these! Nigella can always be trusted. 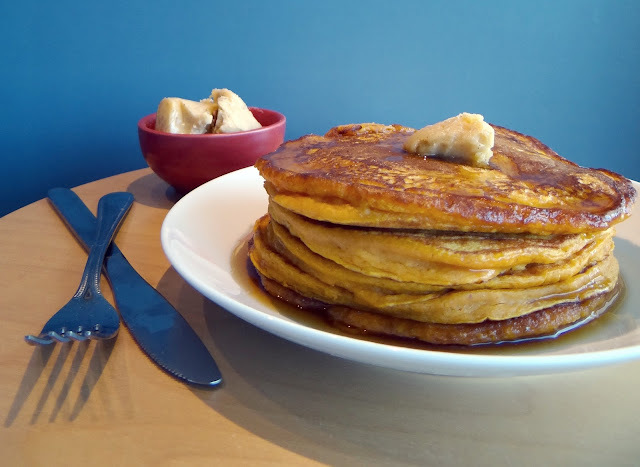 The cinnamon brown butter sounds heavenly and pumpkin pancakes surely seem to be the way to go for that leftover puree! These are some nice looking pancakes, good job. Thank you! I hope you'll give them a try!